From the next academic year, the UCL Institute of Neurology (ION) will be rebranded UCL Queen Square Institute of Neurology. The decision to rebrand the institute follows Council approval for an extensive ~£250m programme of capital works, enabling our vision to be one of world's leading translational neuroscience centres. 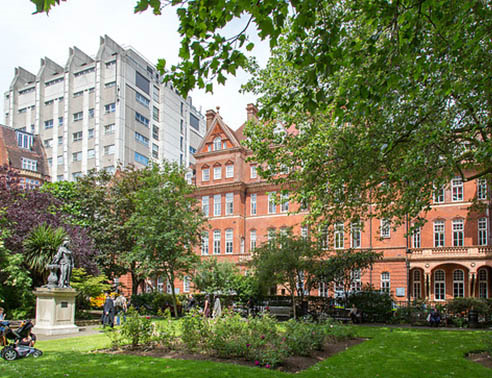 We will retain space in Queen Square House adjacent to the National Hospital for Neurology and Neurosurgery in Queen Square, and build a state-of-the-art brand new building on the Eastman Dental hospital site (EDH) on Gray's Inn Road, just a few minutes-walk from Queen Square. This will allow us to create a dual hub neuroscience centre with ION experimental trials and patient research at Queen Square and ION preclinical neuroscience and the UK Dementia Research Institute hub at the EDH location. To emphasise the strong partnership between the ION and the National Hospital for Neurology and Neurosurgery (UCLH NHS Trust) and to capitalise on the international reputation of Queen Square, UCL Council recently approved the recommendation made by the Institute of Neurology Executive Committee, to rename the institute to the 'UCL Queen Square Institute of Neurology'. The rebranding will be implemented in the new academic year, effective from 24 September 2018.